We’re net positive for 2013! We’re net positive for 2013! We used 7,206 kWh and generated 8,575 kWh for a net surplus of 1,368 kWh. 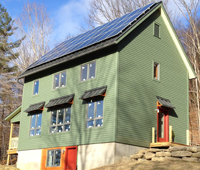 We used an average of 19.7 kWh per day. We used 29% more energy and generated 3% less than last year. 2013 was 16% cooler than 2012. The coldest day of 2013 was Jan 3 at -7 degrees F, and the coldest day overall was Jan 24 at 60.8 HHD. We’re 21% over our projected energy use of 5,950 kWh for the year. We used about 85% of the estimated 2,440 kWh for hot water energy. We used 26% of our heat energy estimate for the year. Our BTU/SF/HDD is 0.425. BTU/SF/HDD is a common measure to compare the efficiency of houses of different sizes and climates. We recorded 6,810 HDD (base 65F) for 2013. The ASHP used 1195.782 kWh for heating in that period. Converting kWh to BTUs, 1195.782 kWh * 3,412.14163 (kWh to BTU conversion factor) then divide by 1408 SF and divide again by 6,810 HDD = 0.425. We used an average of 66 gallons of water per day. 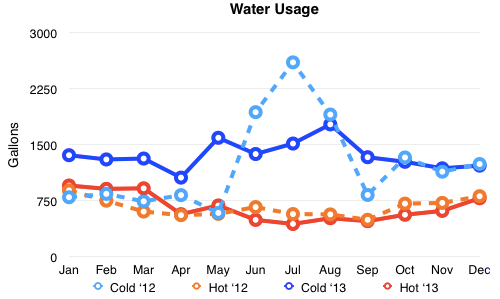 33% of our total water usage was hot water. It takes about 264 watts to heat each gallon of hot water and 2.644 watts to pump it from the well. That’s it for 2013. Happy 2014 everyone!